Apple is quietly wrestling with a security conundrum. How the company handles it could dictate the pace at which cybercriminals accelerate attacks on iPhones and iPads. Apple is hustling to issue a patch for a milestone security flaw that makes it possible to remotely hack —or jailbreak — iOS, the operating system for iPhones, iPads and iPod Touch. The patch is completed, Apple spokeswoman Natalie Kerris said in an interview. But Kerris said on Friday that she was not able to give a time frame for its public release. Jailbreaking refers to hacking iOS to download Web apps not approved by Apple. This used to be difficult. This spring, a website came along called JailbreakMe.com that made it trivial to jailbreak your own iPhone or iPad. Last week, a technique for remote jailbreaking appeared on the site. 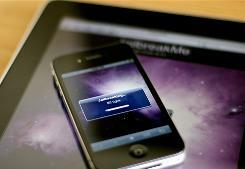 It’s now possible to access the operating system of an iPhone or iPad owned by someone else. An attacker would get “fairly complete control of affected devices,” says Michael Price, an operations manager for McAfee Labs. No such attacks are known to have happened yet, he says. For the moment, the most visible concern for Apple has been pranksters going into Apple and Best Buy retail stores and jailbreaking display models, according to tech blog Engadget. Yet, the security and privacy issues are serious. Security experts expect the pattern that has come to dominate the PC world to begin to permeate smartphones. Bad guys continually flush out new security flaws in PCs, then tap into them to launch malicious attacks. Good guys, meanwhile, scramble to patch and block. Now, cybercriminals are rapidly adapting PC hacking techniques to all smartphone platforms, including Symbian, Google Android, Windows Mobile, RIM BlackBerry and Apple iOS. IPhones, in particular, have become a pop culture icon in the U.S., and now the iPad has grabbed the spotlight. “The more popular these devices become, the more likely they are to get the attention of attackers,” says Joshua Talbot, intelligence manager at Symantec Security Response. Apple’s problem is singular. The company has made a big deal about hiding technical details of iOS, allowing only approved Web apps to tie in. This tight control initially made it easier to keep iOS secure. But now Apple may have to share iOS coding with anti-virus firms, says Sorin Mustaca, development manager for anti-virus firm Avira. Tech Jives is proudly sponsored by the worlds leader in IT certification training, CED Solutions! It may be long overdue, but Microsoft is finally coming out swinging against the rise of OS X. Apple has long played the underdog against the giant, writing Microsoft off as stodgy, technologically backward, and problematic. Microsoft let them do it, focusing more on promoting their efforts than denigrating Apple’s products. This stance confused some, why didn’t they bite back? It was on a long past episode of Diggnation that Alex Albrecht summed it up, saying in short that Microsoft didn’t even want to acknowledge Apple as a competitor. Doing that would give Cupertino market credibility. Now it seems that enough is enough, and Microsoft is finally fighting back. Tech Jives is proudly sponsored by CED Solutions! Chrome Experiments now has over 100 demos on offer, and we picked out some of our favorites for this little gallery. We tested all of these experiments in multiple browsers, and almost all of them worked in Safari and Firefox, though they performed much better in the latest beta of Firefox 4 than in the current stable Firefox 3.x builds. Some of them also work splendidly in the latest Microsoft pre-release, Internet Explorer 9 preview 3. In short, you don’t need Chrome to view these, but they will all be more impressive in Chrome than in other browsers. A laser that doesn’t produce light would ordinarily be a failure. After all, the first two letters of laser stand for light amplification, not light reduction. But a new laser created by scientists at the National Institutes of Standards and Technology and JILA, a joint institute of NIST and the University of Colorado at Boulder, shoots beams of night instead of beams of light. The “dark pulses,” as the NIST scientists ominously call them, create areas absent of light. The research could improve fiber optic communications. Pulses of light fade or degrade over long distances to cause noise and errors. Dark pulses don’t have the same drawbacks, which should improve the transmission and detection of light through fiber optic cables .